*Update: 9/19/10 - Drove by and this was the sign on both sides of the place and inside! I'm confused, haha. Below is the original review. I thought I'd never do another frozen yogurt place until I received a coupon for Greenberry in the mail. 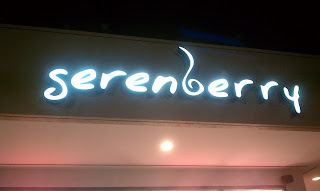 So after reviewing Yogiberry, Mr. Yogato, Caliyogurt, and YogiCastle, here's another! I'm going to bet this isn't my last one either because they're popping up like Starbucks. This place is located in Mid Pike Plaza so there is plenty of free parking. The closest metro is White Flint on the red line. They offer outdoor seating too. The decor is cute and trendy. Lots of modern furniture and chairs of different heights. 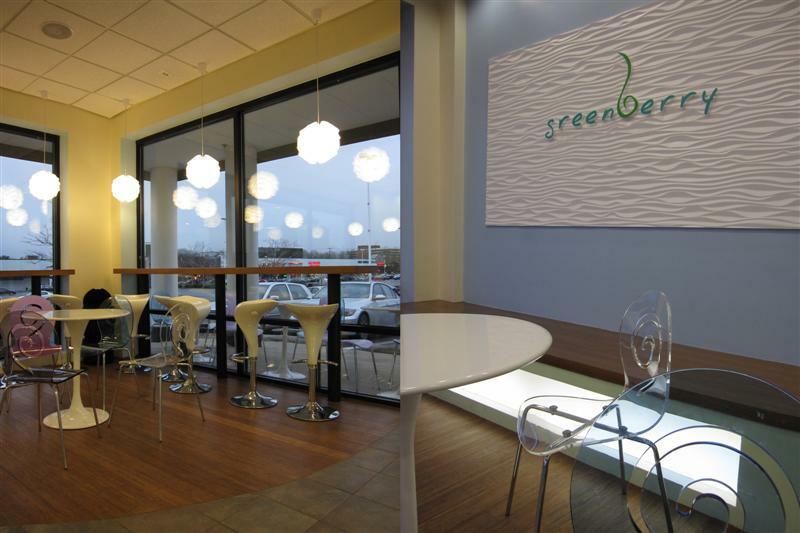 There are regular tables, bar stools for the wall, and short egg shaped chairs. They offer 4 flavors: Original Tart, Strawberry, Chocolate and a Weekly Special (Pomegranate). Sizes: 5oz- $2.95, 8oz- $3.95, 14oz- $5.95. Toppings: 1- $.95, 2- $1.49, 3- $1.75. Cool topping: Ferrero Rocher $.75. This seems random but delicious! 9oz yogurt, 2 toppings with fruit on the bottom ($4.95) or 16oz yogurt, 3 toppings with fruit on the bottom ($6.75). GB Smoothie (strawberry, blueberry, raspberry, and blackberry)- $5.25. Or you can choose your own smoothie concoction: choice of 3 toppings= $4.95. Each topping after is $.65. The bf ordered a 'GB Smoothie- Yogurt blend with Strawberry, Blueberry, Raspberry, and Blackberry' for $5.25.' It was good, kind of thin and not too sweet. For my free yogurt, I ordered 'Pomegranate Yogurt with Mango topping'. I like how they put the toppings in between the yogurt so it doesn't fall off. The Pomegranate yogurt was SO GOOD. It wasn't very tart, but the flavor was so delicious and the texture was so smooth. Loved it. I thought it was a cute place. There is a lot of room for hanging out with friends. The decor is trendy and clean. 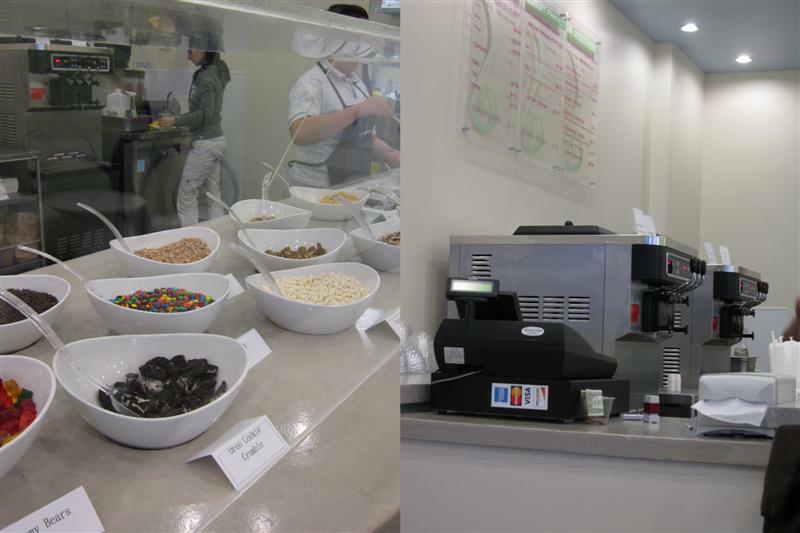 The staff was nice, and they offered the normal things like cereal toppings, candy, etc. They did have some unique items: rainbow mochi, Ferrero Rocher and Parfaits. My only gripe is the price...expensive. Its very comparable to YogiBerry, where an 8oz with 3 toppings is 71 cents/oz. Caliyogurt (45 cents) and YogiCastle (39 cents) with toppings. Bring a coupon if you go. Dinner and a movie is such a relaxing way to start off a weekend. The bf and I went to see Alice in Wonderland 3D at Regal in Rockville Town Square, and had dinner at this pizza place called Giuseppi's a few doors down. We wanted something fast and affordable. There is free parking a few blocks away and garage parking. The closest metro stop is Rockville on the red line. Very fun and colorful interior! The yellow part of the wall shows off their love for the Pittsburgh Steelers. There are arcade machines in the back to entertain the kids. Plenty of tables and seating along the walls. I got the 'Everyday Pizza Special- 2 slices of cheese and a large soda' for $4.50. Each extra topping is 25 cents. I got mushroom and pineapple on different slices. I thought the mushroom slice was better only because it was a lot of crushed pineapple and it wasn't that sweet. The pizza itself is thin and chewy with a crispy bottom layer. The bf ordered the '12in Giuseppi's Italian Sub- ham, cappacolla, salami, provolone cheese' for $8.50. No complaints from him on this sub! It's a family-owned and run place. You can tell they support their community with all of the photos and items hanging on the walls. The owners are very funny and personable when they're working there. The food is very affordable and they serve pizzas, salads, subs, calzones, platters and appetizers. Their 'Dinner and a Movie' deal is awesome: with each $5 purchase, get a movie ticket for $6.50. A few weeks ago I was in NYC to visit my friend NV and to get some other things done. We always eat at some great places whenever I'm in the Big Apple. This trip I didn't have much free time, but we were able to fit in two delicious noodle soup meals. 922 2nd Ave and 49th St.
We stopped by for a quick bite since we were in the area. There are a couple of these restaurants in the city. Small place, but I love that about NYC. TONS of tiny places with great food. The menu is big and has items other than noodles too. We both ordered soup. There are 7 kinds of noodles you can order, and then you tell them what kind of meat/toppings. I ordered the 'Mandarin Noodles with Duck' for $6.45. Duck is one of the best things on earth. I can't believe how cheap it was! I was stuffed and finished about 90% of my bowl. My friend ordered the 'Spinach Noodles with Fish Balls and Wonton' for $6.50. For our late night meal with a bunch of friends, we went to the East Village location because the Midtown one was closed for the night. Most of the restaurant is their bar seating, which was full. You can see them cooking right in front of you. We sat in the back at a table. The place is very narrow, but I love how it looks. I ordered the 'Kiki-Age: Shrimp and Vegetable Tempura Udon' for $6.95. OMG isn't it beautiful? It tasted great, and I ate the entire thing. My friend NV ordered the 'Curry Set- Curry and Udon Soup' for 8.95. That's a good deal for both! I love Japanese curry over rice. Everyone at the table ordered a 'Calpico' drink. I had never heard of it before. It's a lightly carbonated yogurt drink for $2. Quite refreshing. Menus with pictures are the best! I love NYC and try to go every 6 months. So much food everywhere! Hope to get back there again in the summer when it's warmer. The reality is that nearly 17 million children in America—that’s almost one in four—face hunger. DC will be participating from 9am to Noon at the farmers market at Eastern Market (7th Street & North Carolina Avenue, SE). Come on by and support this great cause! If you'd like to participate in the DC area, join our team! You can also make a donation. 100% of the proceeds goes towards the cause. Colleen from FoodieTots is in charge of the DC event. I was able to get my girls Sqrl from Squirrels and Sweets and Maiya from Beans Rice Life to participate with me! As food bloggers, we have the luxury of eating amazing food all the time. This is a great way to give back. It's going to be a ton of fun, so mark your calenders! To my NoVa readers, you have not been forsaken! I'm finally writing about another NoVa restaurant. My apologies...I'm hardly ever in VA, but I'd like to change that. There has been so much hype surrounding Ray's Hell Burger, so I knew I had to try it. I went with a couple of friends on a Sunday night for dinner. You know a place focuses on the food if they have a sign like that. Parking is limited in this small shopping center, but there is metered parking along the road. The closest metro stop is Court House on the orange line. This place is CASH ONLY, and you pay at a register, get a number, and they bring your food to your table. The line moves very fast and they hand you a laminated menu in line. I was overwhelmed because everything sounded good. The place is small and crowded. We were sitting at the furthest table from the window, so this really is how big the place is. They offer outdoor seating for nice days too. Onto the menu! The reason why this place has become so popular is their burger size, quality and topping options. You can get these 10oz beef burgers cooked in a 1 of 5 different styles, the option of 11 free toppings, a variety of cheeses including brie (my fav), and some really crazy ones too. If you're feeling adventurous, top your burger with bone marrow, foie gras or truffle oil. You can make any combo you'd like, or order from their preset burgers. Sorry for those that don't eat red meat, there are no turkey burgers, Boca burgers, or Portobello Mushroom burgers. I was so indecisive, but I chose one of their preset burger options, 'B.I.G. 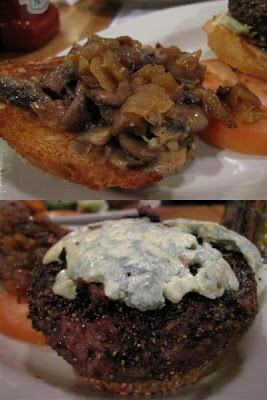 Poppa- Au Poivre Burger with Black Peppercorn Crust, Aged Danish Blue Cheese, Cognac and Sherry Sauteed Mushrooms, Grilled Red Onions' for $7.99. Just typing that out made me salivate. What a burger! The burgers are served to you open faced. Do you see how huge this thing is? The burger doesn't come wrapped in paper or foil to help keep it neat. It's extremely messy, juicy and slidey. I had to cut it in 6th in order to keep things in check. On the menu, they suggest ordering all burgers Medium-Rare. I personally like my meat that way, so you can see how the center is very pink/red. There was so much flavor in this burger, OMG. The peppercorn crust was very strong, the cheese was pungent and the mushrooms and onions gave a nice caramelized finish to even everything out. The bun was toasted and the burger was so juicy. I was very impressed at the quality for $8. I was only able finish 5/6 of the thing, and felt like I was going to have a heart attack (not literally, but you know what I mean). Pretty funny, but everyone at the table either ordered my burger or 'The Punisher- Diablo Burger (Grilled and Brushed with Our Spicy Chipotle Marinade), Pepper Jack Cheese, Charred Jalapenos, Grilled Onions and Piranha Sauce (Fiery, Spicy Green Sauce)' for $7.99. If y'all know me, I'm not a huge fan of "kill my taste buds" food, so I didn't get to try this. Some of my friends didn't think it was spicy enough. Everyone but me ordered a side of fries or sweet potato fries, and I really liked the sweet potato fries. Some of my friends ordered their burger well-done, so their food came out a bit later. One of the free toppings/sauces is 'Heck Sauce', which reminded me of a Texas Pete-type sauce. I would have to say it was one of the best burgers I've ever had because it tastes great, the beef is moist, the toppings are different, and you get a lot for your money. I don't think I could eat this as frequently as other burger places because aside from it being far from me, it's too huge and sits heavy in your stomach. Naming some of the burgers after rappers is entertaining too (Biggie, Big Pun and Fat Joe). 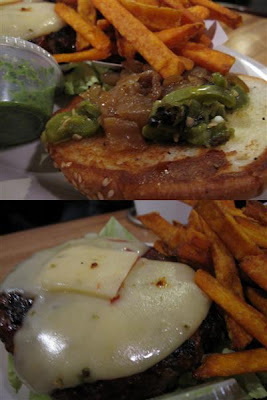 Next time I'd probably split 'The Burger of Seville- Seared Foie Gras, Sauteed Mushrooms, Bordelaise Sauce, and Truffle Oil ($17.50)' with someone. The runners are funny, the cashiers are super quick, and it's a great place to come with friends and chow down. They offer beer and wine, and even a 60oz Draft Root Beer for $6.50. 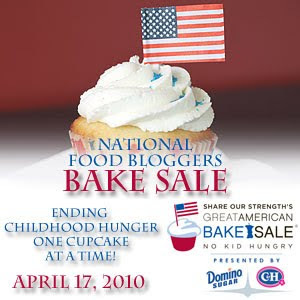 *They will be closing on August 20, 2010! They were renting the space from Daruma Market, and even though the market is gone, they were in that space on a month-to-month lease. Now someone wants to buy the entire space (former market and restaurant), so they need to get out. I hope they reopen somewhere else soon! I've still been on a quest for great ramen in the DC area. Ippudo in NYC was so memorable, I wanted that feeling again. One of my coworkers told me about Ren's Ramen in Bethesda, and asked me 4 times if I had gone yet, so I knew I couldn't put it off anymore. This place was kind of hard to find. Located in a tiny, random shopping center. Look for this sign on the side of a building at the intersection of Arlington Rd and Bradley Blvd. Parking is difficult too since it's limited. We parked across the street at another shopping center. Closest metro stop would be Bethesda on the red line. When looking for this place, look for this sign! The market is no longer there, but at least you can see their sign and know you're in the right place. 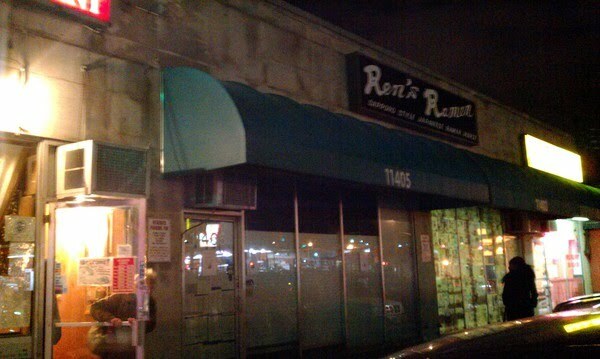 Ren's Ramen is connected to this market on the right. Finally we found it! As you can see, there isn't really a sign, just white letters on the window. Sunday lunch was packed! Here's the line to get seated. I think we waited for about 20 minutes. This place is TINY! It can really only fit about 25 people with eaters lining the entire perimeter of the place, and us sharing a table with other people. Nothing special about the decor. Bright yellow walls, posters, folding chairs and tables. 3. Ramen in Soy Sauce flavored broth with meat. You can add toppings to your ramen or order a side of rice or dumplings. The bf ordered the 'Sapporo Style Miso Ramen- Miso (soy bean paste) flavored soup that uses pork based broth with 1pc roast pork, bean sprouts, bamboo shoots, scallions, and ground beef' for $10. He added the 'Stewed fatty pork' for $3.50. OMG the fatty pork was INSANELY GOOD! So much flavor that melted in your mouth. They only give you 2 pieces so it's expensive to add on. The soup was good, not too salty. I ordered the 'Sapporo Style Shyou Ramen- Soy sauce flavored soup that uses Tonkotu (pork base) broth with 1pc roast pork, bean sprouts, bamboo shoots, scallions, and ground beef' for $10. This soup was much saltier than the miso one. I actually preferred the miso one, and the bf liked this one better. I thought it was a lot of food for me, but he didn't think so and ended up finishing mine too. I've only been to 2 ramen places in the area, and I'd have to say I prefer this one over Temari's because the broth has more flavor. The flavor is partially because it's oily. It's still not as good as Ippudo in my opinion. $10 for a bowl isn't cheap either considering a bowl of pho is like $6. Remember it's 'cash-only'. Its definitely a hole in the wall, but the people are nice, and it's a quick place to grab some noodle soup if you're craving ramen. Baking is science, so starting to make cookies from scratch at 12:30am can be disastrous if sleepy.